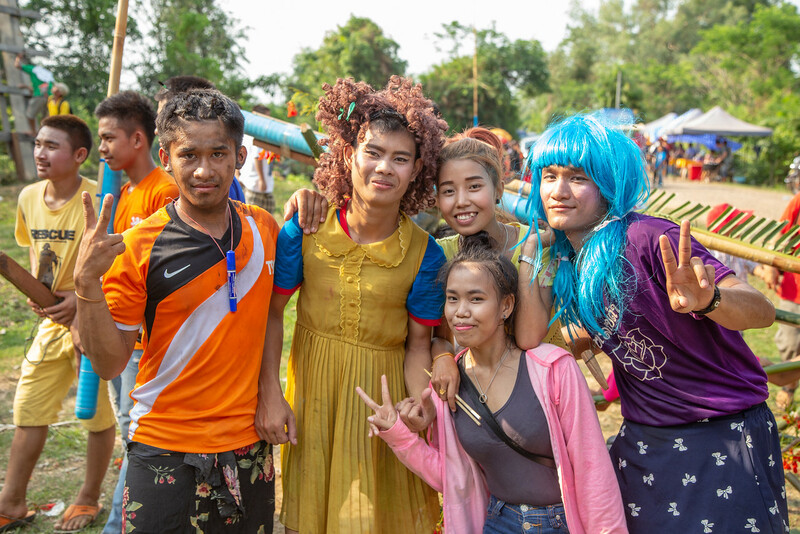 One of the largest of these Bun Bang Fai celebrations takes place in the village of Lingxan, a few hours north of Vientiane, Laos. 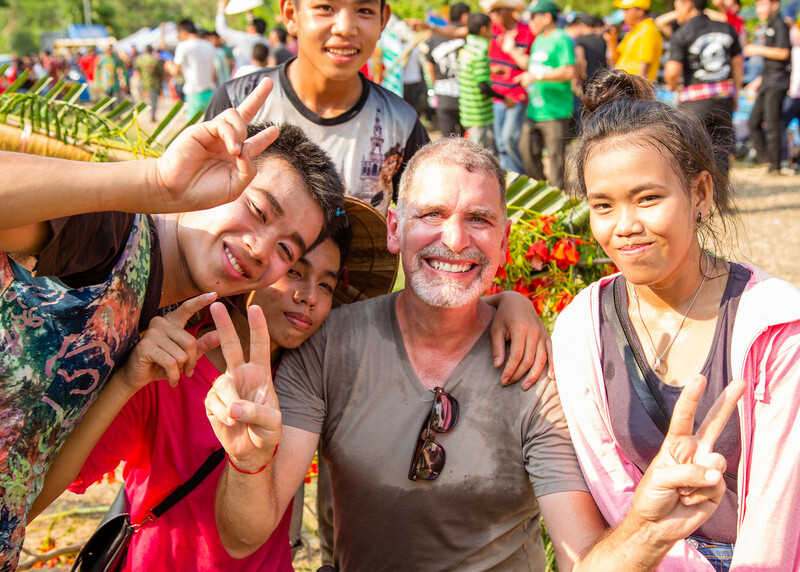 Since we were “in the neighborhood” celebrating my birthday on Lake Nam Ngum, Sarah and I figured we should stop in and see what was happening at the rocket festival our way back to Vientiane. We thought it would be quaint to see what happens when you mix pre-Buddhist fertility rites with the 9th Century invention of gunpowder. What we found was a village alive with activity and maybe just a little bit of mayhem. The front garden of every house was filled with a karaoke machine and partiers steadily drinking Beer Lao, occasionally punctuated by a toast of (Lao Lao) rice whiskey. 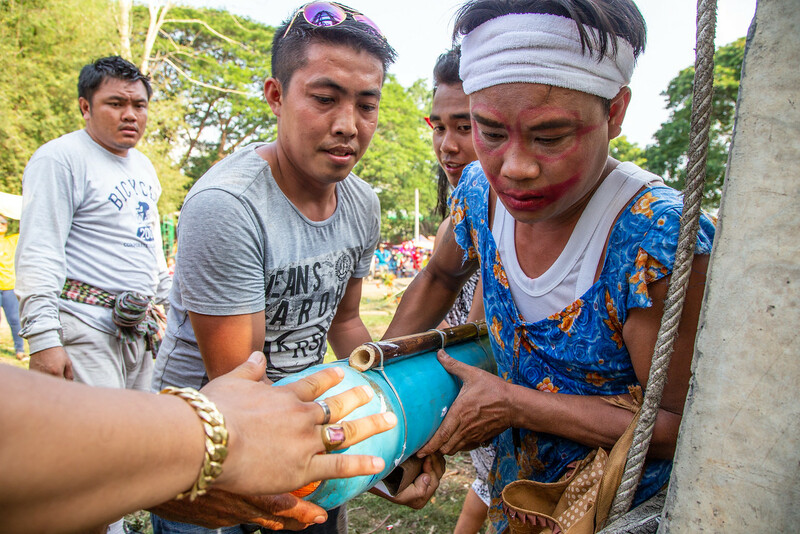 In the streets, there was a steady procession of floats bearing competing karaoke sound systems, inebriated revelers, guys in women’s clothing and gunpowder filled tubes being pulled by two-wheeled rice paddy tractors. Rocket fuel, alcohol and chain-smoking cross-dressers being pulled by tractors driven by children; what could go wrong? 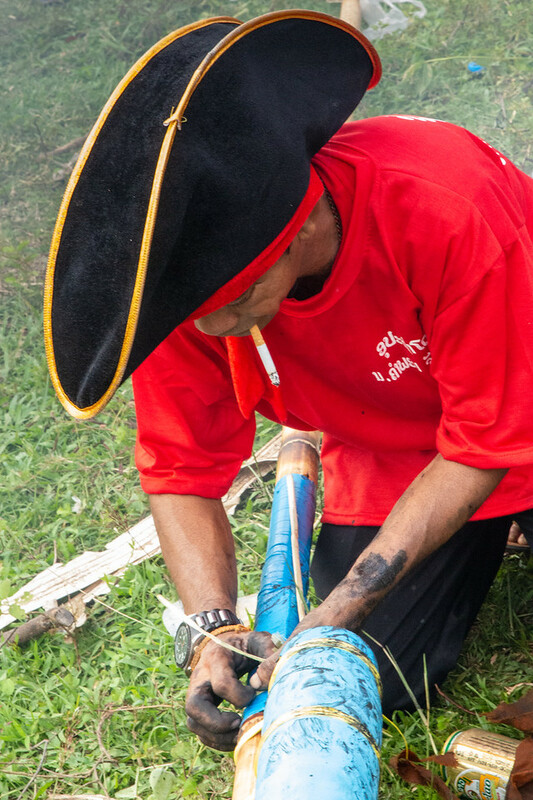 Traditionally celebrants have constructed Bun Bang Fai rockets from natural materials like bamboo, but in an effort to go ever bigger, higher and faster, non-traditional materials (it looked to me like sheet metal, PVC pipe and duct tape were the most common alternative ingredients) are now being used to supplement the ancient techniques. 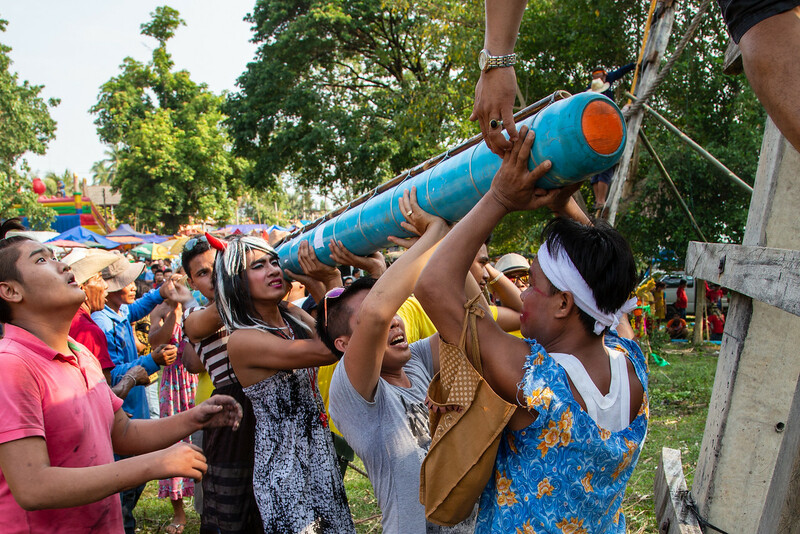 For this year’s festivities, celebrants in Lingxan had constructed 200 of these unguided missiles. It was incredible. Even though they weigh several kilos, theses ballistic offering to the gods just falls wherever they run out of fuel. Some of the larger, more sophisticated of these rockets can soar to altitudes measured in kilometers. 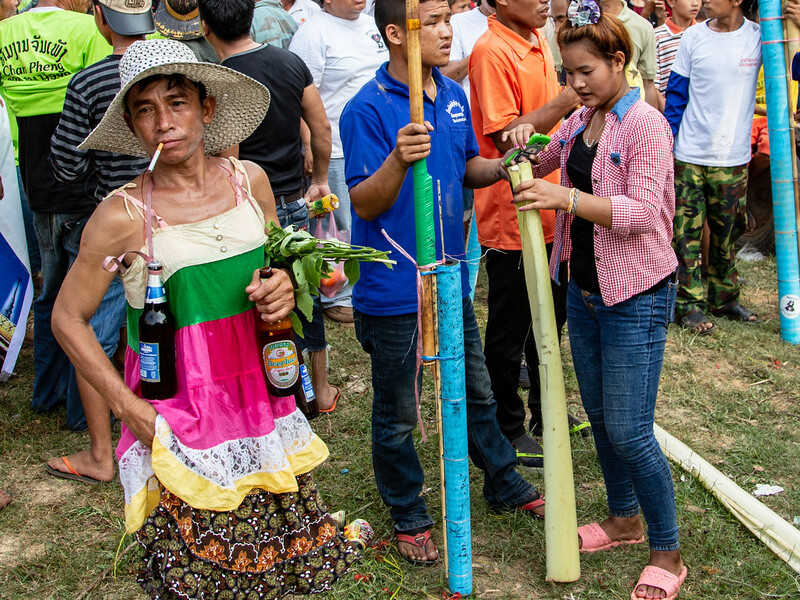 As if these fiery offerings aren’t enough to bring the rains, another rocket festival tradition involves men dressing as women parading around with giant phalluses designed to goad the humorless rain gods into “punishing” their “sins” with lightning and monsoonal rains. It was really an amazing thing to see. Out of a crowd of several hundred, I think Sarah and I were the only westerners. We couldn’t stand for more than a few minutes without someone wanting to bring us a beer, pose for pictures with us or tell us about their rockets. 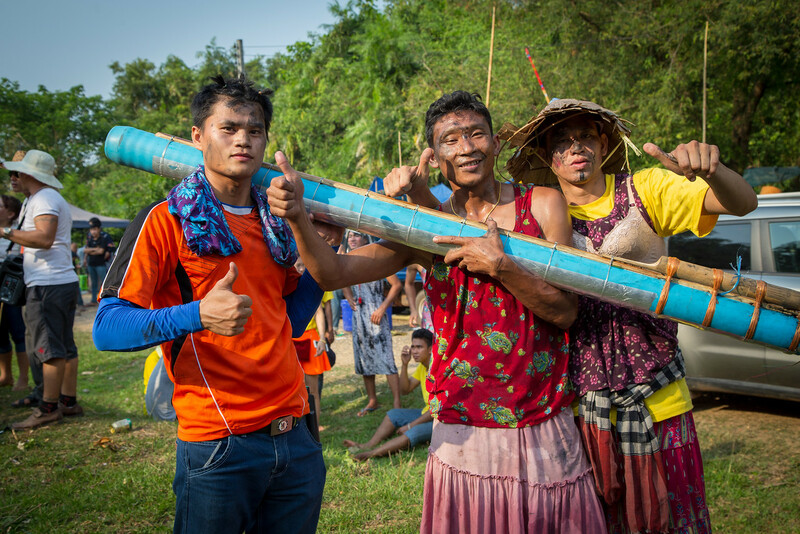 The rockets at the Laos Rocket Festival are set off from permanently designed concrete and wood launch pads upon which the rockets are hoisted by pulleys and then attached with vines. There are no fancy buttons or launch mechanisms here – the launch switch is a pair of bare electrical cables that the operator touches to a truck battery when everything is ready to go, and the crowd is deemed to have sufficiently cleared the area. With smaller rockets, the people who attach them to the launch pad don’t even climb down from the platform. 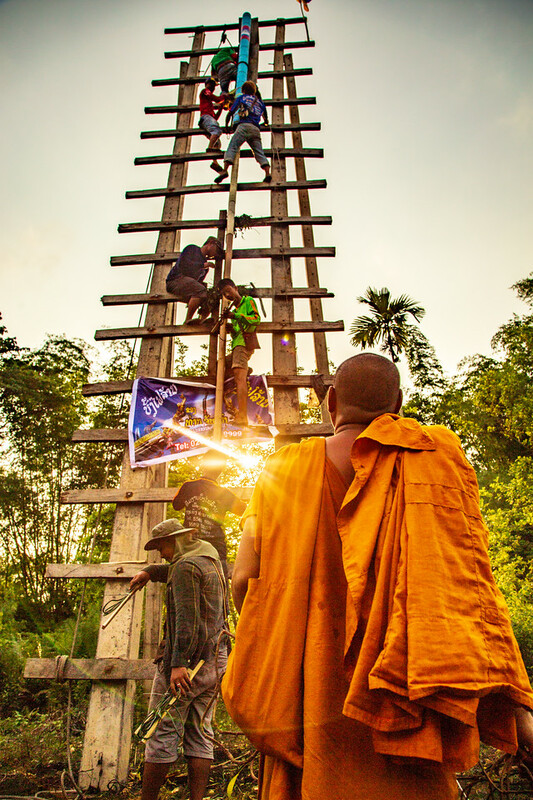 There is just a very quick “blessing” by a Buddhist monk, a flash, and a giant whoosh as these wake-up calls to the gods blast into the air. I was happy wandering around, talking and laughing with everyone and taking pictures. Getting a shot of an actual launch is difficult because there is no countdown, everything happens so fast and it is hard to judge the proper moment to press the shutter. Most of the time, even if I missed the shot, everything went smoothly. I was close enough to the launch pad to actually feel the deafening sound as the rocket took flight, but not so close that it felt too risky. That was until there was a misfire. I was just bringing my eye to the camera viewfinder when through the lens I saw a flash of ignition then not a whoosh, but an explosion. The crowd began to scream and run away and I too began to clear out. Quickly. There was a small ditch about 20 meters from the malfunctioning missile and I tripped as I ran through. I fell into the road and my camera went skidding across the asphalt, leaving pieces as it tumbled. Several bystanders witnessed my fall and came to help. Two of them grasped my hands and pulled me on to my feet. A couple others helped brush me off and made sure I was okay. Someone else brought my camera, which unfortunately seemed to be “bricked”. Other than a few little scrapes where I contacted the road and a large gash of embarrassment I was okay, but I still didn’t know about the others. Smoke still enveloped the launch area and there was a bit of confusion for a few minutes afterward, but miraculously I didn’t see anyone who seemed substantially injured. Even those who were standing on the platform when the rocket exploded only looked a little dazed. I found Sarah, who was of course more than a little relieved that all was okay, and we just wandered around a little longer. I was happy to find she had captured the explosion with the GoPro! Even with the little incident, it was a wonderfully amazing experience and a fantastic way to spend my “Birthday Boxing Day”.